Some kits have aftermarket sleeper and other have sleepers made by the truck manufacturer, how can you tell the difference? I know the Mercury sleepers in the Diamond Reo, White Western Star, and Road Boss are aftermarket But what about the sleeprs in the IH 4300 and GMC General and the Italeri Superliner? Also, how sacreligious is it to mix brands of cabs and sleepers? I want to build a modernized 4300 with a larger sleeper and I bought the frame, engine, and sleeper from the Revell 353/359 kit to use but it appears to have Pete brand sleeper and I didn't want to do anything that is frowned upon. As someone who worked for 15 years at an International truck dealership,I can say the the 4300 kit has a correct looking sleeper for what the factory installed,(and covered by factory warranty)I cannot say if they were made "by" international,because I always thought the factory sleeper installed on the Chevy Bison/CMC General looked very similar.The Road Boss,Diamond Reo and Western Star kits come with a sleeper know as a Mercury sleeper and was one of the very first custom sleeper builders,most Mercurys were added to day cabs in the early days,before the factory offered them as an option.Since about the early 70's almost all truck makers built and installed there own inhouse sleepers.You still have a coule of aftermarket custom sleeper companys out there.Bentz,Double Eagle,and ARI are some of the first that come to mind. And I will say being in heavy truck repair for 30 years I have seen more than my share of KW sleepers on a WesternStar,Pete sleepers on Internationals and all sorts of mismatched sleepers,and may funky ways to make them fit. Unless you are building a fresh from the factory model..	once a truck gets into the hands of its owner, anything goes ! Yep anything goes. Alot of truck manufacturers had outside companies build their bunks. On the Mercury sleepers, they were factory options for Peterbilt back in the day. The factory would make the truck ready for the sleeper, the sleeper would be built at Mercury, the truck sent over there, then the sleeper installed and painted (or vice-versa) to match the truck, then sent back to Peterbilt for finishing and on to the dealer. On the older Internationals, all the sleepers were aftermarket. 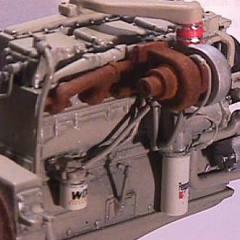 The sleeper in the ERTL IH 4300 kit is a McLaughlin Li'l Honey. I'd have to look at the GMC General/ Chevy Bison sleeper but it may be made by McLaughlin as well. I wasn't sure if they were made by the factory or not,I just know we covered any problems under warranty only if they were factory installed.They offered a 36",42" and a 60".Did the same company make all three? They all looked like the same framework. I'm sure IH used other sleeper manufacturers as well but I think McLaughlin was the main company. They did make all the sizes you listed as well as a stand up 60" called the "McLaughlin Super Suite" I have a resin one listed right now that I mastered a couple years ago. It's designed to be used with the ERTL 4300 kit to make an Eagle Brougham. Great, I just like to check these things out first. In the mid 90's IH switched to Bentz sleepers as thier supplier. Yes, all Prosleepers will built in house at either the Springfield OH, or Chatham ON plant. Prior to the Porsleeper the ran Bentz's for a few years. Never knew IH sleeper boxes of the period were done by an outside company- I'd always assumed (I know, I know...) they were designed and built in-house. Interestingly I am thinking of trying out a Mercury sleeper on a Transtar, glad to know it would be correct for an earlier version of the rig if nothing else. I think I've seen Mercury sleepers on every brand of truck at some time or another. Double Eagle sleeper (CLOSED UP) up this Summer.